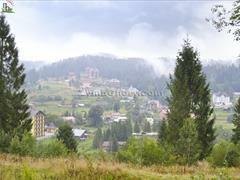 The Cottages "Panorama" located in Skhodnitsia village of Lviv region. The springs of mineral water №№ 5, 6, 25 and 26 are located in 10-15 minutes walk from the cottage. In the cottage "Panorama" guests are accommodated in three two-story cottages. There is a brazier, parking, a swing on the territory. The rooms of the 1st and 2nd floors have separate entrances. The cottages have round-the-clock hot and cold water supply. Panorama Hotel welcome guests in resort Skhidnytsia!